It looks quite small from the outside but don’t get fooled and turn away. There is a large non-smoking room in the back with a kids play area. The cafe concept is retro 1960s; it’s like going back in time. The menus look like old Newspapers and are in old Czech (unfortunately they do not come in old English) and the decorations in their window screens are of old pin-up girl paintings. 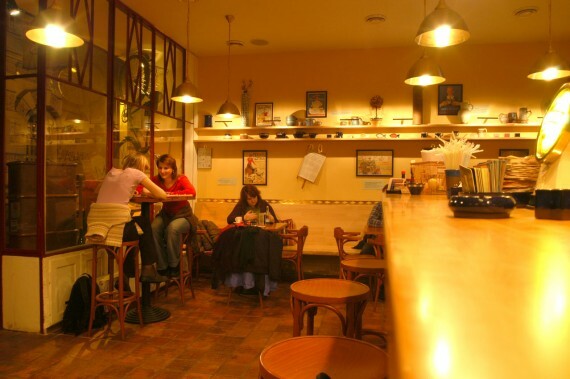 This Cafe is perfectly situated right in the centre of Prague, a few metres from Wencelas square and Vodickova street. And do you know what a Beef Jerky is? Then click through to find out and taste it right at this cafe. If you go there, let me know how crowded it was, because it looks like any time I go to discover a new place it is always empty and then Larissa and Karen experience it totally packed. Just like a BIO cafe for example. By coming here you are doing the right thing. The whole concept behind the name “Therapy” is that the restaurant helps train and give confidence to people who didn’t have it easy in life. Some of the waiters are people who went through all kinds of Therapy and now they are trying to fit back into society. This should be of no concern because if I hadn’t told you, you wouldn’t have even realised it. Also, right opposite the play-area there is the office of a Child Psychologist who helps families and their kids with any kind of issues. This service is only available in Czech. On site is also a shop selling ceramics that have been made by disabled people or people with surviving difficulties. Therapy has a front smoking area room with a small bar, but the second room with the play area is big and with fresh-air. Someone I know commented that they had experienced the rear room smokey - but from my own experience - it was fine. I am not sure what to think about the play area. I was happy it was there and boys fully appreciated it, but my hands were itching not to grab a sponge and antiseptic spray and scrub it all over. It needs re-painting badly and I strongly suggest some final safety touches. The complete non-sense is, that the play area is in front of the kitchen door and waiters have to pass by with hot meals on plates running up and down. The play area doesn’t have any gate and any kid can run straight under their feet having hot soup pored over their heads. Quite risky I thought. With my husband we sat on little chairs next to the play area to supervise our boys, but we learnt from the waiter that many parents just sit and chat away, while the kids play unsupervised and if something happens the staff often gets accused. kids they have a special Children’s Menu consisting of Tom and Jerry pudding (semolina pudding recommended by 4 out of 5 children) and Winnie the Poo surprise (buttered chicken, pork or turkey meat with potatoes). The boys loved the pancake with ice-cream and I helped myself to a Cuba Libre cocktail. They have many cocktails and Hubby was driving.